I thought they’d be able to pick being black or white or something entirely different. That was naive. I do not think of my sons as black, but they think of me as white. The author and his sons. It is not a compliment. “That’s what it’s like having a white dad,” my younger one said after I told his friend we put away our screens at the dining table. “White dad” syndrome now gets invoked after discussions about homework status, what they do with their free time, and why they and their friends must clean up after they have pillaged the snack drawer. I seriously doubt this reflects anything about my race; plenty of fathers of any race are not laissez faire kind of guys. 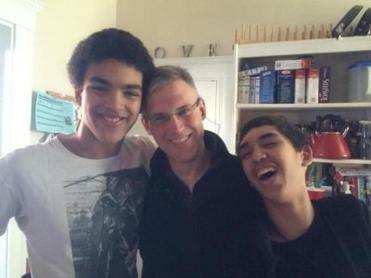 But it does show that at 15 and 13, my sons know how others see them: as black. Nearly a decade ago, I wrote an article in this space about how being the white father of black children didn’t seem to mean much in 21st-century America. My boys were in elementary school then and just starting to ask questions about racial identity. I probably thought they would be able to pick being black or white or something entirely different. That was naive. Still, when I look at them, I just see my boys. I need to know better. I realized the other day, watching them with a bunch of friends at church, that other people looking at them do not see younger versions of me, young white men. Other people see them as black. That means they are subject to a different set of stereotypes and social rules than I. That’s true even in progressive Cambridge, where we live. It is, after all, the home of Gatesgate. My wife, who is black, tells me we get looks all the time that I am somehow oblivious to. She thinks people wonder whether this graying white man is her sugar daddy, especially if we’re with the kids. I expect I’ll start noticing those looks more now. I bet I get even more looks when I’m out alone with my sons. I’ll never be a black dad. But I do share some things with black fathers across the country: pride. And fear. Not that my kids are guaranteed to be pulled aside for walking while black or pulled over for driving while black, forms of harassment funded by my tax dollars and those of my better-paid software engineer wife. In fact, a white police officer dealt justly with our older son when a careless driver hit his bicycle as he was walking it in a crosswalk on Mass. Ave. He made sure my son got home safely and that I knew the collision was not my son’s fault. But our younger son has already experienced shopping while black. His class performed a play about discrimination they had experienced, from bullying to being ostracized. He told us about it at the dinner table and said one of his contributions was a story about being followed by a CVS employee up and down three aisles of a store. As a white dad, I could think that that’s just what store employees do with teenagers of any race, but my younger son, at 6 feet 2 inches, does not look like a teen. And when he told us he had gotten fed up and turned around and started following the employee, I clapped my hand over my eyes and said, “You can’t do that!” I imagined him getting arrested, or even shot, simply for looking at things in a store. Killings like those of Eric Garner, Michael Brown, and Walter Scott made me mad. But I was angry as a citizen, the same way I was angry about a white teenage boy being shot to death in Michigan during a routine traffic stop a few months ago. I talked with my kids about that white teenager too. We also talk about the police as a civic institution. One of their uncles is a police officer, and while we don’t talk much about his work, we do talk about how the police see people at their worst, every day, and that doing so changes the way they look at people. I hope that somehow these kinds of conversations stick, so that if my kids ever do get pulled over for driving while black, they’ll remember what officers go through and why it’s important not to be at your worst around them, no matter your race. But that’s white dad talk, and I have an inkling of just how sheltered white dads can be. White dads can be angry about the killing of Samuel DuBose in Cincinnati, because why wouldn’t we be? But dads of white sons don’t get the phone call Trayvon Martin’s father got. White sons don’t get shot because of the way they look. As a white dad, I didn’t used to take these things personally. I never thought my sons were at risk of being shot while black, because I never thought of them as black. Michael Fitzgerald joined the Globe Magazine staff as articles editor in March 2016. Send comments to magazine@globe.com.